Tramp a major route of the Silk Road as it winds, through remote and magnificent mountain scenery, from the ancient caravanserai of Tash Rabat to the high pass at 4,000m. Vivid echoes of a remarkable history, superb landscape, a still-strong local culture and the possibility of animal sightings. What's not to love? 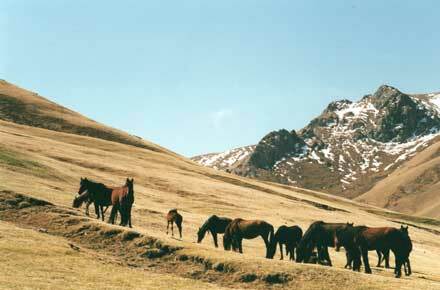 This is a strenuous walk in high, remote mountains, where altitude can affect you. Come prepared. High in the wilds of the Tianshan mountains, a traveller on the Silk Road would have reached with relief an extraordinary shelter in this dangerous landscape: the fortified caravanserai of Tash Rabat. 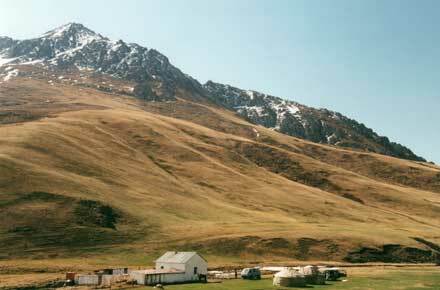 This ancient complex lies in the former Soviet Republic of Kyrgyzstan, near the border with the western Chinese province of Xinjiang, where the Tianshan, the romantically named Mountains of Heaven, approach their junction with the Pamirs, after forming the northern boundary of the vast and fearsome Taklamakan desert. The Silk Road was a braid of routes which linked China, the Middle Kingdom and centre of the world as far as it was concerned, with distant and semi-mythical Indian and Mediterranean regions, and the Roman and Byzantine empires in particular. The passable routes changed over the centuries, as powers rose and fell, and areas descended into lawlessness or re-emerged with the advent of some new strongman. From the Chinese heartlands, the route followed the narrow Hexi corridor between the twin terrors of the Tibetan plateau and the Gobi desert, splitting to skirt the Taklamakan to the north and south, pausing at oases along the way. There was even a route on the steppes north of the Tianshan, which rejoined the southerly trails via Almaty in modern Kazakhstan. West of the Taklamakan, the Tianshan swing round to meet the Pamirs, which become the Hindu Kush and then the Karakoram in the south. There were various ways over these barriers, west toward to the wealthy if often despoiled oasis cities of Central Asia or southward toward the Buddhist heartlands of India. 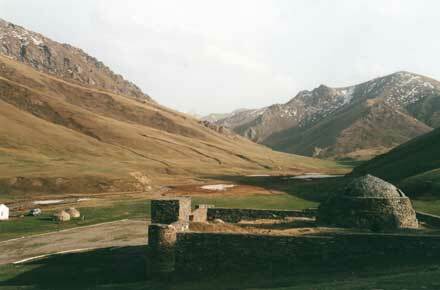 The Tash Rabat pass lies north of the Kashgar oasis at the far western corner of the Talamakan. 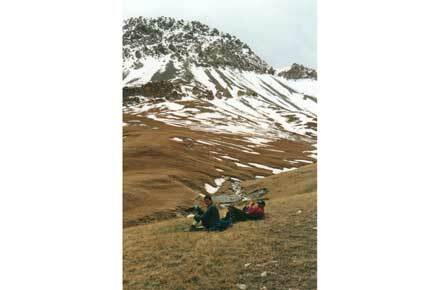 Though the pass is relatively low at around 4,000m, long winters of deep snow made the route passable in summer only. The Silk Road was arguably the greatest ever cultural highway, along which ideas and technologies as well as goods passed from as far apart as the Roman and Chinese worlds. Buddhism reached China along the Road, evidenced by the arrival in Chinese art of concepts and styles which were alien to its earlier culture. There were also Nestorian Christian, Muslim, even Jewish communities in Tang dynasty Xian. The oasis-cities of the central deserts were as a result cosmopolitan, wealthy and home to a creative stew of ideas; but they were always at risk from invaders and the relentless sands, and the cultures of the Taklamakan in particular vanished, with few traces and little record, until rediscovered by the great archaeologists of the late 19th and early 20th Centuries, Aurel Stein and Sven Hedin. Trade was, of course, the lifeblood of the Silk Road. The product that defined the route was silk made in China, which guarded the secrets of its manufacture for centuries. It was so prized in imperial Rome that it was profitable to transport it overland in huge caravans, passing through a chain of middlemen as it was transloaded onto new animals for each stage of the enormous journey. The intermediate steps were so many that the two great empires remained only dimly aware of each other. Other products traded along the Road included precious metals, woven materials, ceramics, spices, camels, horses and other animals. Another great, and terrible, catalyst for change travelled westward along the Silk Road: the Black Death, the underminer of feudalism in Europe. Any trade route needs servicing, and the wealth and risk represented by the caravans spawned an extensive network of caravanserais, many of them still surviving, which provided accommodation, food and protection for merchants, their servants and animals and their precious cargoes. They were in cities and towns along the way, but were also vital security in remote and lawless regions, shelter from the hostile human as well as natural environment. Tash Rabat is a classic of its kind, and extraordinarily evocative. Tash Rabat squats, square and brooding, protected by massive walls and corner towers, partly embedded into the hillside behind. It is accessible only through a single strong gateway. Inside, a series of linking chambers around an impressive, domed, central hall provided accommodation for merchants, their retainers and their animals. It is a gloomy and faintly sinister place, lit only by small openings in the roof. It had a defendable roof, an internal well and a dungeon. Behind it, a tunnel was dug for more than 200 metres back into the hillside. It was built of dry stone, its survival over the centuries a testament to the skill of its masons. It must have felt utterly remote ? but secure once behind its massive door. History lies heavy here, and the people who sheltered here, and their lives and fears, and easily and vividly imaginable. Following the old caravan route up the valley to the high pass is what you are there for, although you could walk here for days. Your base is likely to be the custodian's whitewashed croft in the valley bottom and the white canvas yurts in the meadow beside it. You will set off up the wide valley floor, perhaps passing herds of ponies or yak. Grassy slopes rise steeply on both sides until they end in crags and false ridgelines. This must have been uneasy country for the caravanners, each cleft possibly holding a raiding party. The valley narrows, and you start to climb. The stream divides into several sparkling branches which you cross and re-cross. Around an insignificant-seeming bend, you are suddenly gazing into the impenetrable looking wall of the At-Bashy range, jagged crags over thick snowfields, looming majestically at the far end of the valley, where the stream divides in an aquatic T-junction. The route turns up the steep hillside to the right and, after a steep slog, emerges high above the stream, across it to your left the peaks, cliffs and snows of the high Tianshan. You eventually drop to the stream and labour up above a valley which climbs into the heart of the At-Bashy. You can almost hear the curses of the Silk Road drovers as they thrashed their unwilling ponies up the final steep traverse across a high hillside to the col. Here you gain the grand view south across lake Chatyr-Kul toward the final line of smaller peaks and then the wild plunge down to the Tarim Basin and the Taklemakan Desert. The pass is saddle-shaped and windy and cold, even in Summer, so you will soon retreat to the lee of a rook for a rest and snack. Getting to Tash Rabat is not easy, even now. Kyrgyzstan suffered a catastrophic decline independence, losing the aid it received due to its strategic proximity to Russia's friend turned foe, China. 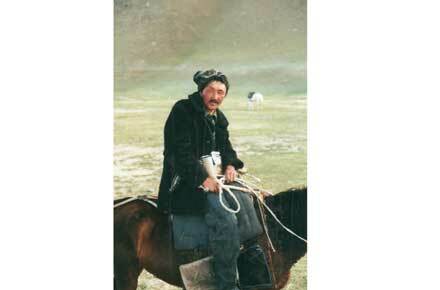 Mainly mountainous and lacking the natural resources of its neighbours, it is semi viable as a country. There is no public transport and your only option is to hire support or join a group.